To the indomitable Emperor, his eternal and beloved Sovereign and Majesty Rudolf II. From Giuseppe Arcimboldo of Milan, of multiple and varied ideas conceived by his own hand for the provision of tournaments. In the year of grace, 1585. 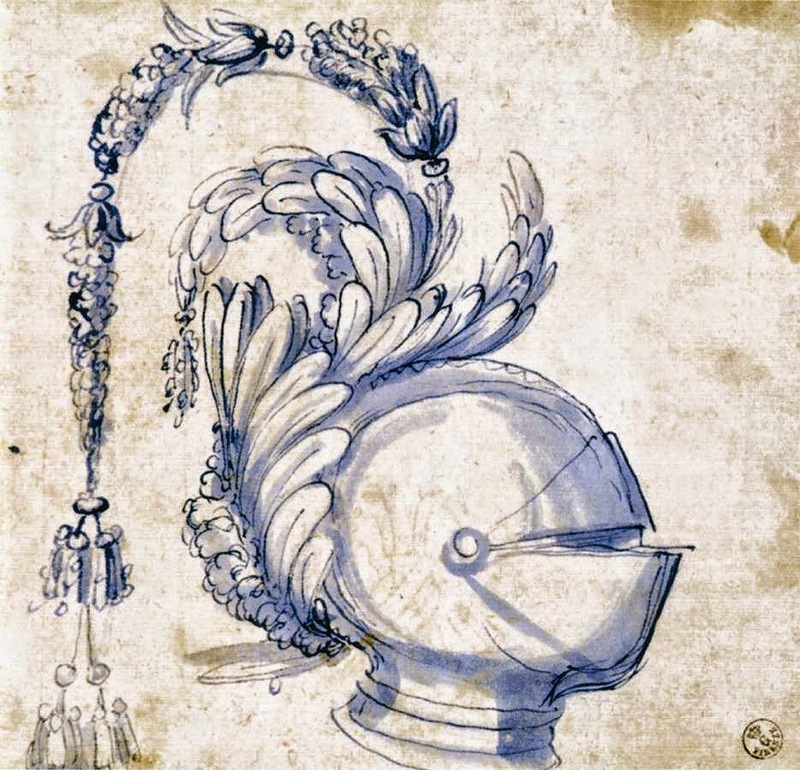 This collection contained several drawings and sketches which Arcimboldo created for royal celebrations, pageantry, festivals, and processions. The majority of these drawings were created in pencil and blue wash, with subjects ranging from animals such as elephants and dragons, to objects such as carriages and sleds. other drawings depicted theatrical costumes, worn by members of court who assisted in the parades, accompanied by inscriptions to explain their functions. For the liberal arts, for example, he designed a robe for Geometry, inscribed above: “Geometry under the auspices of Archimedes the Sicilian and Archita the Calabrian. Grey robe,” a robe for Astrology, notated: “Astrology under the auspices of Ptolemy the Alexandrian and Julius Hyginus the Roman. White robe edged in red with golden stars.” The majority of the designs, which are in Vienna and in Florence, were studies in preparation for the celebrations of the marriage of Archduke Charles of Syria and Maria Anna of Bavaria. Fonteo gave a poetic account of it, including a long description of the festival, of the procession, and of the ceremony. With his help, Arcimboldo designed the show, glorifying the patronage of the emperor.